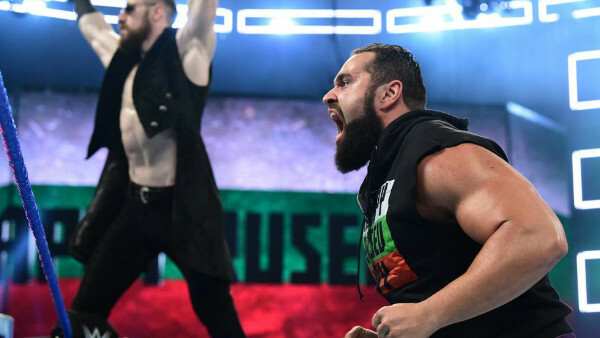 Toll the bells on this glorious Rusev Day, because the "Lion of Bulgaria" (according to Corey Graves) is heading to Money In The Bank for his first ever MITB Ladder Match. He does so at the expense of Daniel Bryan, who lost his first match since calling off his retirement pre-WrestleMania 34 and returning to the ring. You can't have failed to miss that on this week's SmackDown, given the song and dance the announcers made over Bryan's misfortune. But what could viewers have missed? A whole load of little Easter eggs, slip-ups and confusing contradictions for the live crowd, that's what. Thought AJ Styles and Shinsuke Nakamura were only doing backstage promos due to WWE docs refusing to "medically clear" them in time? Think again. That was complete nonsense, and so was Tom Phillips suggestion that The Bar and The New Day had made history in Baltimore. Tom got a little confused and stuttered his way through that line. Maybe he was distracted by the fresh hairdo Corey Graves was sporting next to him.